For easy installation, use our TuffRing II Power Driver. Packaged in bags of 25, but sold individually. You can purchase a TuffRing II Power Driver to make installing much faster and easier. Deeply defined threads to provide a secure grip in wood posts. Predrill holes in the wood post. Thread twine and rope, IntelliBraid, MaxiShock or IntelliTape. Put bit end of TuffRing II Power Driver into chuck of drill and tighten. Place power driver over the insulator so the ring of insulator fits into cup of driver. Drive insulator completely into post. 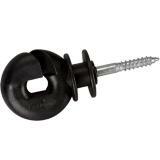 Allows use of a power drill to rapidly screw in ring-type insulators in and out of wood posts. Recommended: 17 out of 18 said they would recommend this product to a friend. It took us hitting one of these with a tractor to break it, so they live up to their name. 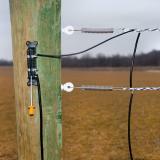 A versatile insulator that works just as well as a line fence insulator or a terminal insulator (can be used with P-Springs). 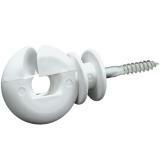 This is “our” go-to wood post insulator. When installing, use the power driver. 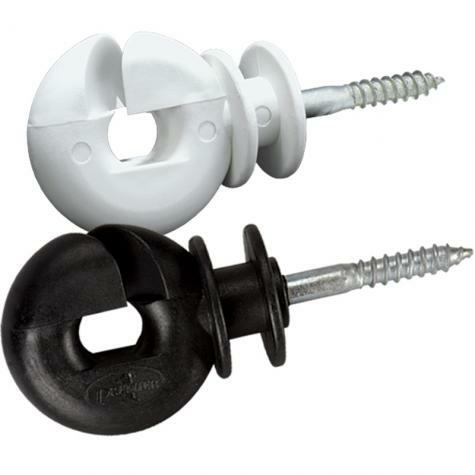 Not designed for use at corners, the rotating PI 21 or Rotating Corner Post insulators are recommended. 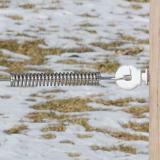 While installing a temporary fence I used farm store insulator rings and twine. My POODLE ran through it and broke the insulators and the twine acted like a epilator. Premier1 tuff rings do not break and the intellabraid is soft to the touch. I also like the driver. It cuts the work of installing insulators in half. I fully recommend Premier1! Dealing with Premier1 has been a pleasure and efficient quick response time in delivery. 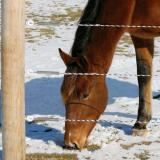 The "braided" rope fencing for our horses is good looking, easy to work with and very effective. Well worth the money bar far. Live up to their name. Other insulators occasionally broke when I screwed into post. Didn't have a Tuff Ring break yet. Easy to use and strong. Great way to end a rope fence.